Many of us remember growing up and having at least two or three travel agencies on our Main Street. We’d go there to book airline tickets to go back to college or perhaps our entire family would file in and we’d sit and plan a family vacation by looking through brochures and listening carefully to what the travel agent behind the desk told us. Travel agents still exist, but they’re not all on Main Street. It’s easy to work from home, thanks to the Internet, or to set up an office that’s remote, where people don’t just walk in off the street, looking for assistance. The best travel agents get their customers through word of mouth. A friend will come back from a great trip where they enjoyed insider access to hotels, restaurants and attractions and they’ll share the name of the agent who set it up for them. 1. Communicate. Tell the agent all about yourself so he or she will know your preferences. If they don’t have a good sense of you, they won’t be able to intuitively put together a program that you will like. 2. Answer all of their questions. Don’t skimp on the details if they ask you which vacations you took in the past that you really enjoyed, or which ones you took that you hated. They are trying to narrow down the millions of choices that are out there for travelers. If you wake up in the middle of the night and remember something you didn’t tell your travel agent about a past trip, call or email them in the morning so they can add it to your profile. 3. Be up front about budget. Don’t be shy if for this trip you don’t have as much as you’d like to pay for a vacation. 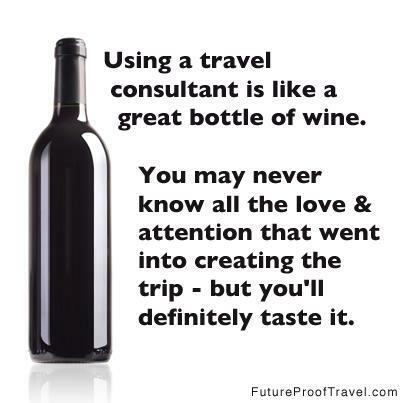 If the travel agent has good contacts in the industry they’ll probably still be able to put together a nice itinerary for you. Eliminate the back and forth of rejecting options because they’re too expensive by setting your budget right up front. 4. Don’t forget the details. If you are taking a family vacation, don’t forget to tell the travel agent right up front that your daughter needs to fly out a day later than you or that your spouse needs to go home a day early. After the airline tickets are secured, this is a very tough thing to unravel and it will end up costing you money. Write down all of the logistics the travel agent needs to follow in the very beginning so these details don’t get forgotten in the excitement of planning the vacation. 5. Do doublecheck the pricing but don’t overdo it. If your travel agent presents you with an itinerary and the overall cost of the trip, you will be tempted to go home and compare it to what you find on the Internet. Go ahead and do this but realize this: You may not be comparing apples to apples. Your travel agent may very possibly have gotten you a room with a view at the hotel whereas the room you see online that’s cheaper may be facing the parking lot. They may have also been able to get you other perks, such as free breakfast, early check-in or transfers from the airport. Yes, it’s fair to compare but don’t overdo it. Ask about the pluses that are included when you get your itinerary so you’ll know what you’re up against when you go back to the Internet. 6. If something goes wrong on your trip, contact your travel agent at that very moment. Don’t wait until you go home. If your airport transportation wasn’t there for you if you landed, if your room was not the same as the one you reserved and paid for, make the call. They can often fix these things on the spot. Don’t sweep it under the rug. And often a good travel agent can go the extra mile to be sure you are compensated for your problems, perhaps by getting an upgrade or at the very least, making sure your grievances are known the proper person at the top. 7. Don’t ever assume. You may want an oceanview room or a balcony because that’s what you saw on the hotel’s website, but don’t assume that is what your travel agent is booking for you. You might assume there is some great nightlife at the resort you’re going to, but if you told the travel agent all you want to do is lie on the beach and have silence all around you for a week, you may find yourself in a remote destination that’s deadly quiet, 24/7. Ask questions and spell out anything you feel could have been misinterpreted in your first conversation. 8. Value their knowledge. A good travel agent is someone who has actually gone to the place you want to go to or has colleagues who have been there. They are also likely part of a good network that gives them the tools to know much more about hotels and destinations than you could ever find on the Internet. Be sure to ask your travel agent what their affiliation is and what it provides that’s special. 9. Give feedback. If you plan on using this travel agent again, be sure to download with them when you get home. Tell them what went right and what went wrong. If there were things you would like to have done differently, let it be known. That will allow them to watch for certain things when they plan the next vacation for you. 10. Where to find a good travel agent? Visit websites such as www.virtuoso.com;www.signaturetravelnetwork.com; www.travelleaders.com; www.ensembletravel.com;www.travelleaders.com and http://www.amextravelresources.com. In many cases they will be able to match you up with someone in your area or someone with a certain expertise in the destination you’re most interested in.